The Funky Felter: My Etsy Shop is up and running again! Woot! My Etsy Shop is up and running again! Woot! Thanks to a very helpful husband (and extraordinary new daddy too), my Etsy shop is up and running once again. After almost six months - yes! six months! - on hiatus, I am getting back into the swing of things. I'm slowly listing all of those felted wool beads that I made over the summer. 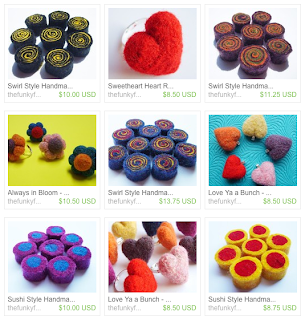 There are also old favorites listed like my felted heart and flower rings. Please stop by and check out my newly revamped shop when you have the time. And, I plan to send out a monthly newsletter in the next couple of weeks so if you haven't signed up, please click here and do so. Congrats on re-opening your Etsy shop, and on your new baby : ) I have a three-year-old and an eight-month-old, so I am very much in tune with the trials and travails of fitting in creative work with parenting. You seem to be striking a good balance and have some good help, which is so great! Look forward to keeping up with your work!